Trip is geared for Jewish men of any background or affiliation. • Hebrew knowledge is NOT required. • Membership and/or affiliation with any synagogue is NOT required. 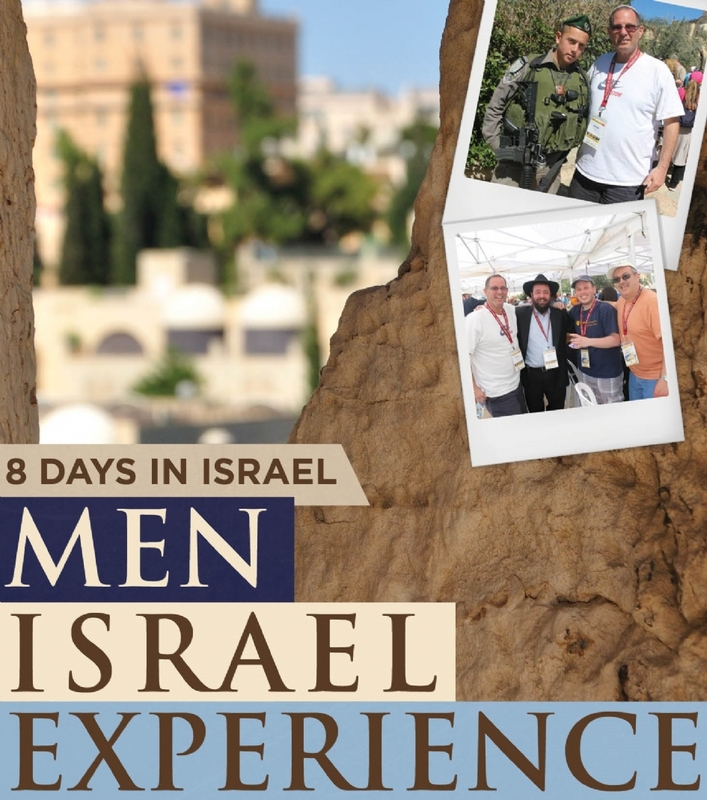 • This trip IS for reform, conservative, orthodox or any Jew that moves! See more details and registration form below. Want an informational meeting - to ask any questions you have - email rabbi@GotChabad.com. To see Highlights of the trip and an itinerary, please click here . Please note: Sites/dates may change due to security, time, weather or other considerations. A final itinerary will be forthcoming before the trip. 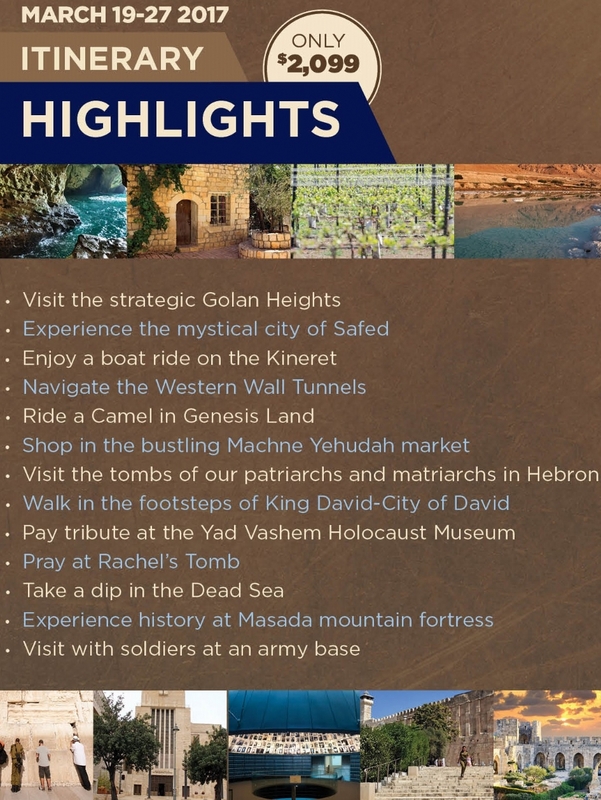 ♦ For more information about this amazing trip to Israel for men, please call (508) 473-1299 or email rabbi@GotChabad.com. ♦ The special rate of $2,099.00 (double occupancy) will cover lodging in beautiful hotels, transportation on luxury coach buses, admission fees, as well as most meals in Israel. ♦ The rate does not cover travel to/from Israel. And does not cover some meals and tips. ♦ We are working with a Sky2000 travel agency for great rate for flights on El-Al (or other airlines) from Boston. Those flights/rates are only available for a short period of time, so if you want to get one of those flights, contact us ASAP. And you are welcome to make your own flight arrangements. ♦ In order to reserve your spot, please fill out the information below and pay the $500 deposit by credit card. ♦ Full payment can be paid below or by check. ♦ A more-detailed registration form will be emailed separately. Up until December 31, 2016 – No cancellation fee applies and your deposit will be fully refunded. If notice of cancellation is received between December 31, 2016 and January 31, 2017, a $300 cancellation fee will apply. All other monies received will be refunded. If notice of cancellation is received between January 31, 2017 and February 15, 2017, an $800 cancellation fee will apply. All other monies received will be refunded. After February 15, 2017 – No refund is available. There is no refund for sites not visited or individual program events not participated in for any reason. ♦ Full payment must be made by December 19. If you need more time please contact us. ♦ Tour is being coordinated by Chabad and run in Israel, by "Love Israel Tours"
♦ We strongly encourage you to buy third-party travelers insurance that will cover your trip, in case of an unexpected need to cancel... as well as insurance for a medical emergency. ♦ The itinerary is subject to change based on security, weather or other concerns. ♦ You'll receive a complete day-to-day itinerary before the trip. Double Occupancy: With someone specific (List his name below)Double Occupancy: Alone (If available, we will choose a room-mate for you. )Single Occupancy: A private room. ≈ Full payment must be received by December 19, 2016. ≈ To pay the remainder with a credit card, click below. Please note: a 3% service charge is added. Please mail the check to Chabad, 34 Cedar Street, Milford, MA 01757. Once the check is received you'll be added to the list. When the form is complete, click submit below. Payment of deposit and/or full payment is not a guarantee that you are accepted and/or that there's room for you. Once the deposit is received by credit card above, (or by mail at the Chabad Center,) you will receive an email with further instructions.